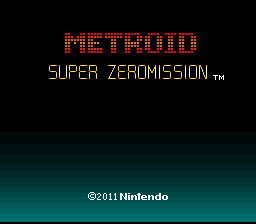 A complete hack that artfully combines the essences of both Super Metroid and Metroid Zero Mission. A lot of ASM modifications were utilized in order to freshen up the gameplay considerably. 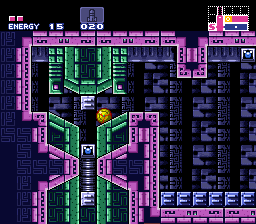 Only the standard abilities of Samus are required to play this hack, but players adept with advanced techniques will find ample opportunity to use them. 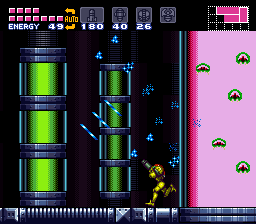 This hack, made by a Metroid hacker from Japan, is turning the heads of numerous Metroid hackers from the english-speaking world. Find it here. This game is pretty hard, but not one of those impossible fanhacks…it’s definitely beatable without cheating. Also, I never use savestates and this game has reasonable save points, making it fun to play on real hardware. It drove me insane for awhile, but I always wanted to keep going back. This one’s a 10 hour+ game though. Part of the reason it’s so long is the map is HUGE. Sometimes it took ten minutes just to walk from where you are to where you need to be. One good thing about the game, is there’s a bunch of “side quest” type of things (such as getting the x-ray scope) that aren’t required to beat the game. 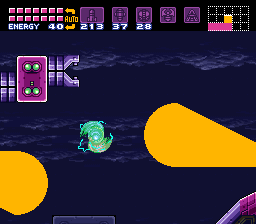 This game was designed to be used with savestates. I played it on all original hardware without savestates and it was rough. Even without save states, there are two parts where you’ll seriously consider GameGenie (if you’re using real hardware). One is awesome if you can complete it without cheating (I couldn’t) and the other is just a useless part that I didn’t feel the slightest bit guilty about cheating through. I don’t really want to explain more, so I don’t spoil anything. There are no clues for where to go, ever. You’ll find yourself walking through the same rooms over and over. Bomb and shoot everything to find where to go, but you may need to cheat and download the game maps. Overall, I really, REALLY liked it…but it’s definitely not easy!